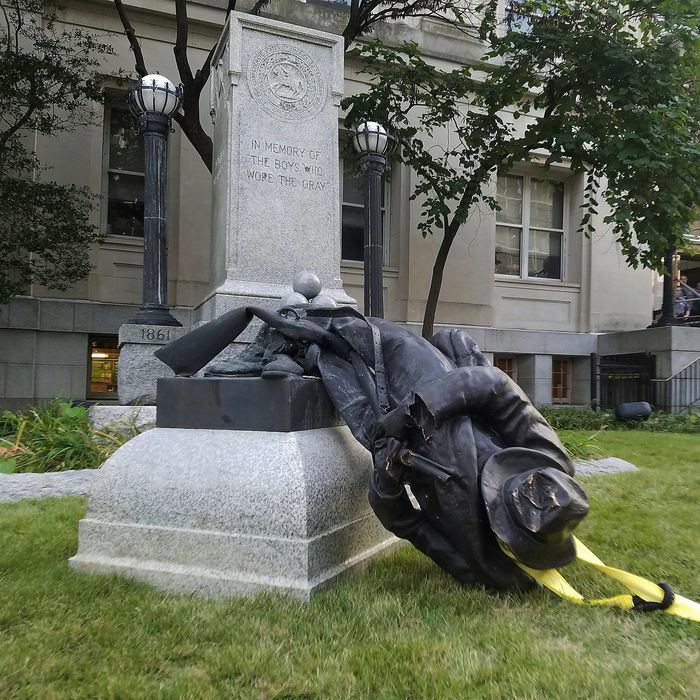 The statue taken down by protesters on Monday. A day after protestors dragged down the statue of a Confederate soldier in Durham, North Carolina, the state’s governor said that all Confederate statues should be removed from state public land. In a lengthy post on the website Medium, Governor Roy Cooper, a Democrat, wrote, “Having served as North Carolina Attorney General for 16 years, I am all too familiar with the racism, bigotry and full-out white supremacy that exist in corners of our society. But it was shocking to watch these elements displayed so publicly — venom and hatred shamelessly spewed in epithets. Nevertheless, Cooper’s call to action is another sign that politicians and activists around the country have become more emboldened to call for Confederate statues’ removal in the wake of Saturday’s violence in Charlottesville. Hundreds, if not thousands, of such markers dot the country, many of them erected by neo-Confederates decades after the Civil War. Cooper also called on the state Senate to defeat a bill, passed in the House, that would block any legal action against drivers who hit protesters obstructing roadways. Such laws are under harsh scrutiny after white nationalist James Alex Fields drove his car into a crowd of counterprotesters on Saturday, killing Heather Heyer.